Personalized Ashtrays and Paperweights in Bulk. Promotional, Inexpensive. 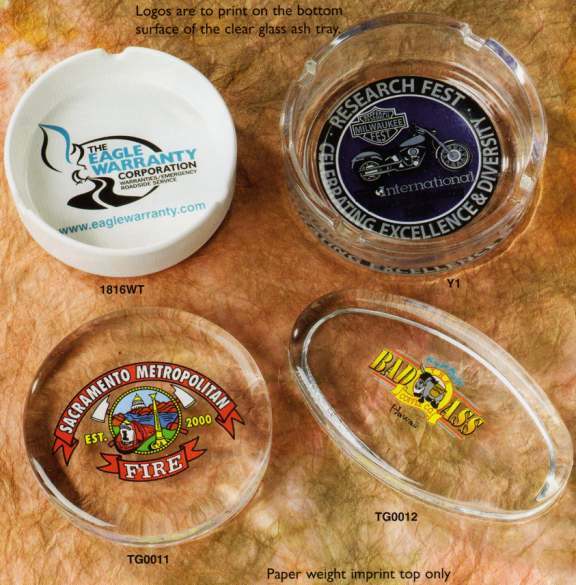 Bulk personalized ashtrays and paperweights of the best quality, customized with your logo or blank. Lowest prices in the USA and Canada for wholesale personalized paperweights and ashtrays. Our personalized ashtrays are made of clear glass or ceramic, while the personalized paperweights are made only of clear glass (see picture). Free artwork design. US clients pay no taxes. We will send you a proof for your approval before production. Please see the Price Table below the picture. Additional Imprint Colors: add $0.50 per imprint color, per item. Production Time: 3-5 working days after artwork approval. Full color imprint is available: contact us. BLANK ITEMS: Please use NQP (Next Quantity Price).